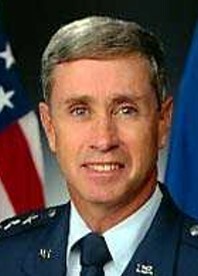 Lieutenant General, USAF, Ret. ; Bachelor of arts degree in mathematics, University of Southern California, 1966; Master's degree in business administration, Auburn University, Alabama, 1979; at the time of his selection assigned at Tyndall AFB, Florida ; semi finalist in NASA astronaut group 8 and 9 selections; former vice commander, Headquarters Air Force Materiel Command, Wright-Patterson Air Force Base, Ohio. Last update on April 30, 2018.